(CNN) - E-cigarettes are increasingly being used as a nicotine alternative as smokers seek ways to kick their habit. They work by heating a pure liquid called e-juice -- composed of flavorings, propylene glycol, glycerin and often nicotine -- until it vaporizes. The resulting vapor is much less offensive to both smokers and non-smokers. But their use has become controversial due to a lack of evidence on their efficacy as anti-smoking aids, warnings about possible long-term health effects and numerous studies showing that teen use is a direct gateway to traditional cigarette smoking. The latest salvo: Concerned with an "epidemic" surge in e-cigarette use by adolescents, the Food and Drug Administration took regulatory action against more than 1,300 US retailers and five major manufacturers for their roles in perpetuating youth access to e-cigarettes. Three pack-a-day smoker Hon Lik, a 52-year-old Beijing pharmacist, created the first successful electronic cigarette after his father, another heavy smoker, died of lung cancer. By 2007, e-cigarettes were marketed in Europe and the United States by manufacturer Ruyan as a way to safely stop smoking tobacco. Hon was not the first person on record to have the idea for an electronic non-tobacco option. Herbert A. Gilbert filed for a patent in 1963, in an era when tobacco smoking was widely accepted and the health risks were less apparent. In September 2008, the World Health Organization announced that marketers should immediately remove any claims that e-cigs are a "safe and effective smoking cessation aid" because there is "no scientific evidence to confirm the product's safety and efficacy." Soon after, a study funded by e-cigarette manufacturer Ruyan declared the product to be 100 to 1,000 times less dangerous than smoking tobacco, adding that when using its device, nicotine is "apparently not absorbed from the lung, but from the upper airways." In May 2009, the Food and Drug Administration released the results of a test of two US e-cig brands, NJOY and Smoking Everywhere, that found "very low" amounts of nicotine in cartridges labeled as nicotine-free. In July, an FDA news release discouraged the use of e-cigarettes, saying they contain carcinogens and an ingredient used in antifreeze, diethylene glycol. Another concern of the FDA's: E-cigarettes are often marketed and sold to youngsters who, intrigued by the many flavors such as chocolate, bubble gum and mint, might easily adopt a smoking habit as a result of trying the devices. Vape supporters counter that diethylene glycol was found at a very low, nontoxic level of 1% and that the carcinogens are at the same levels as other FDA-approved nicotine cessation products, like patches and gum. By the end of the year, Amazon and Paypal restricted the sale of e-cigs on their websites. Science began to ramp up studies on the topic. Several studies found that interest in e-cigarettes was high among the American public: Google searches for e-cigs were higher in the US than any other nation. A questionnaire of 3,500 e-cigarette users found that most vaped because they though it less toxic and cheaper than tobacco, and would help them quit or cut down on tobacco smoking. Most ex-smokers (79%) in the study were afraid they would relapse if they stopped using e-cigarettes. The study didn't examine the safety of the product. Another, much smaller email study of 216 e-cigarette users found that 31% were tobacco-free at six months, and 66% were able to cut back on the number of conventional cigarettes they smoked. A still smaller study of 40 smokers also found that adding e-cigarettes helped smokers reduce the number of traditional cigarettes they smoked each day. The US Centers for Disease Control announced that e-cigarette use among middle and high school students doubled between 2011 and 2012, mirroring a similar increase in adult use. Most alarming for policy makers: CDC concerns that vaping among adolescents may serve as a gateway to tobacco use. To measure nicotine delivery, United Kingdom researchers tested 16 e-cigarettes with an automatic smoking machine and found wide variations in nicotine levels per puff, ranging from 0.5 to 15.4 milligrams. In contrast, the typical level from a tobacco puff ranges from 1.54 to 2.60. The wide variation between e-cigarette brands led researchers to question how well they can function as a nicotine replacement device. 2013 headline: Do e-cigs really help smokers quit? Several 2013 publications showed minimal evidence that e-cigarettes help smokers quit. A cross-sectional study of 1,836 tobacco smokers found a significant association with e-cig use and "unsuccessful quitter" status but none with "quitter" status. Another study of callers to state tobacco quitlines found e-cigarette users significantly less likely to be tobacco-free seven months after they first tried vaping, compared with participants who never tried e-cigarettes. A New Zealand Health Research Council study of 657 smokers found e-cigarettes modestly effective in helping smokers quit. Interestingly enough, it didn't seem to matter whether they contained nicotine. But the results were similar to FDA-approved nicotine patches. Some researchers worried that e-cigarette use might distract smokers from proven safe and effective methods for kicking their tobacco habit. "It's filter tipped, low tar, déjà vu all over again," Dr. Frank Leone and Dr. Ivor Douglas wrote in their essay "The Emergence of E-Cigarettes: A Triumph of Wishful Thinking over Science." The CDC released data showing that the number of calls about nicotine e-juice to poison centers rose from a scant one call per month in 2010 to 215 calls per month in 2014. More than half of the calls involved children under the age of 5 ingesting, inhaling or getting the substance in their eyes or on the skin. A study of over 75,000 Korean adolescents found e-cigarette use to be strongly associated with current and heavy traditional cigarette smoking. Data from the CDC found that the use of e-cigarettes among US high school students grew from 4.5% in 2013 to 13% in 2014. In that same period, use grew among middle-schoolers from 1% to 4%. In regard to safety, a study found that e-cigarettes contain tobacco-specific nitrosamines and heavy metals like cadmium, nickel and lead but that the levels were nine to 450 times lower than traditional cigarettes. The effect on lung function of glycol derivatives found in e-cigarettes was also much less than conventional cigarettes. Still, researchers weren't convinced. "Although these data suggest that e-cigarettes may be a safer alternative to conventional cigarettes," reviewers Bradley Drummond and Donna Upson said, "there are no data regarding the long-term cancer risk associated with low-level exposure to the detected carcinogens. Similar to cancer risk, there are no published data describing the long-term lung function or cardiovascular effects of e-cigarettes." A New England Journal of Medicine study set off alarm bells by reporting that some e-cigarettes release formaldehyde, a probable carcinogen, when heated by high-voltage batteries. Another study looked at 51 of the nearly 7,000 e-cigarette flavors currently marketed to check for a flavoring chemical called diacetyl that has been shown to be associated with a disease called popcorn lung. The study found diacetyl at higher than laboratory normal levels in 39 of the tested flavors. Researchers called for "urgent action" to evaluate the "potentially widespread exposure." In December, a San Diego Veterans Affairs lab investigation found that two e-cigarette products damaged cells in ways that could lead to cancer, even when nicotine-free. Creating an extract from e-cig vapor, the researchers exposed cells in Petri dishes. The exposed cells showed breaks in DNA strands, which can lead to cancer, and a greater tendency toward cell death. However, a 2015 report by Public Health England encouraged the medical licensing of e-cigarettes in the UK as nicotine replacement therapy, stating that the use of vaping is "95% safer than smoking" and "can help people to quit smoking and reduce their cigarette consumption" even "among those not intending to quit and rejecting other support." 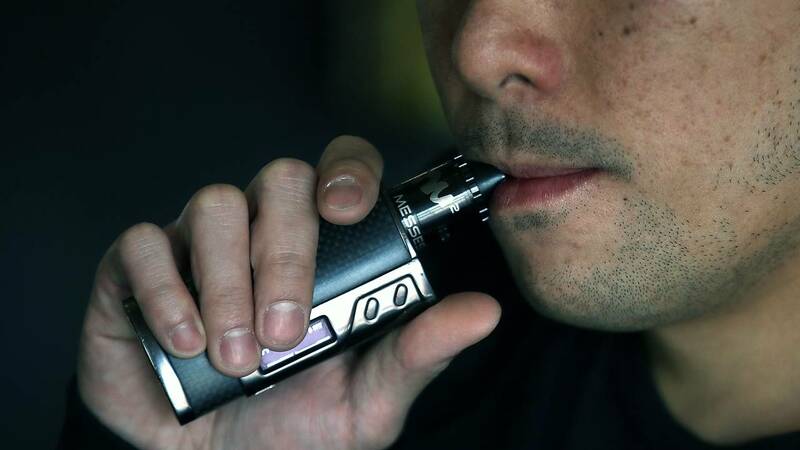 And research from France's Health Barometer, which conducted telephone interviews with over 15,000 people, found that e-cigs "could have helped several hundreds of thousands" quit smoking, at least temporarily. In late January, BMJ published a study that quizzed more than 2,000 Hawaiian ninth- and 10th-graders about their e-cigarette and traditional cigarette use, then followed up a year later. Nearly all of the teens knew about vaping, and 68% considered e-cigarettes to be healthier than smoking. They found that vapers were more than three times as likely to have begun smoking cigarettes by the next year compared with "never smokers." In mid-June, the CDC released data about e-cigarette use among working adults, showing that about 5.5 million Americans use the devices but also tend to continue to smoke conventional tobacco products. Over 16% were still smoking cigarettes, 15% used other types of combustible tobacco, and nearly 10% used snuff or other smokeless tobacco. On the same day, the CDC released information from the National Youth Risk Behavior Survey showing that while cigarette smoking was at an all-time low for high school students since 1991, 24% of them reported using e-cigarettes during the previous 30 days. A study published in Pediatrics looked at cigarette use over a 20-year period by Southern California 11th- and 12th-graders and found that e-cigarettes were "recruiting a new group of users who would not likely have initiated combustible tobacco product use in the absence of e-cigarettes." Another study showed that teens using flavored versions were less likely to see tobacco smoking as dangerous and therefore more likely to take up cigarette smoking. Quoting Department of Health and Human Services data, the study also said an estimated 5.6 million youth could die early from cigarette smoking-related illness unless youth smoking rates drop dramatically. In August, the Food and Drug Administration announced that it would regulate all tobacco products, including e-cigarettes, cigars, hookah tobacco and pipe tobacco, and would prohibit the sale to youth under the age of 18. But the regulations didn't address the role of trendy flavorings, which some said help adults trying to kick their smoking habit. Critics say that leaves these alluring flavors on the market to entice kids to try e-cigarettes. Former smokers who replaced standard cigarettes with e-cigarettes substantially reduced their intake of cancer-causing chemicals, according to a study published in Annals of Internal Medicine in February. And data released in the UK showed a decline in smoking rates simultaneous with a rise in people taking up vaping, with half of them reporting to switch to e-cigarettes to help them quit. Unlike some countries, such as Finland, the UK has supported the promotion of e-cigarettes as an aid to quitting. In July, the Food and Drug Administration announced a "multi-year roadmap" for regulatory action on tobacco products, with a focus on cutting nicotine levels in traditional cigarettes. But the agency stopped short of announcing expected regulations regarding e-cigarettes. Instead, it provided extensions to makers of new and existing vaping products, giving them until August 2022 to submit information to support their products' safety and efficacy as anti-smoking aides. The year started out badly for smokers trying to use e-cigs to kick their habit. In February, a study of nearly 70,000 people found that daily e-cigarette use can double the risk for heart attack. If the user continues to smoke regular cigarettes each day along with e-cigarettes, the combined risk goes up five times. But the big news in 2018 highlighted the growing risk of e-cig use among youth. A study published in Pediatrics found that e-cigarette vapor can contain up to five cancer-causing toxins. Researchers found significantly higher levels of benzene, ethylene oxide, acrylonitrile, acrolein and acrylamide in the saliva and urine of teens 13 to 18 who had smoked e-cigarettes recently; if they also smoked cigarettes, the levels were even higher. Another study in Pediatrics found that youth who experiment with e-cigarettes were nearly two times more likely to become established smokers of regular tobacco cigarettes. In April, the FDA launched the Youth Tobacco Prevention Plan, designed to address the growing use of e-cigarettes in preteens and teens. The agency started slowly, asking manufacturers for information on youth trends and cracking down the marketing of on e-liquids that resembled kid-friendly foods like juice boxes, candy and cookies. In early September, the FDA took the "historic action" of sending over a thousand warning letters and administering 131 fines to stores for the illegal sale of e-cigarettes to minors. Again, the agency stopped short of prohibiting the manufacture and sales of e-juice flavorings, asking the manufacturers to take a hard look at the practice and make needed changes. "They say they've changed from the days of Joe Camel," Gottlieb said. "But look at what's happening right now. They must demonstrate that they're truly committed to keeping these new products out of the hands of kids, and they must find a way to reverse this trend." Stay tuned: The FDA is promising additional action soon.